Medicare Advantage (“MA”) plans allow Medicare beneficiaries to have a private company manage their health care benefits. When a beneficiary opts for coverage via an MA plan, Medicare pays the plan a set amount depending on the patient’s health status. As detailed below, this capitated payment system relies upon providers and plans to honestly report information about a beneficiary’s health. Sadly, Medicare Advantage fraud is rampant, including capitated payment fraud. Our Medicare Advantage fraud law firm partners with honest people who come forward to report these scams and protect the Medicare system, ensuring money is available for those who truly need it. The Medicare News Group, a website designed for journalists and others looking for Medicare-related information, provides a set of Frequently Asked Questions that helps readers understand a complex health care system. The FAQ explains that capitated payments are per patient rates paid to a physician or other medical provider. Capitated payments are based on a patient’s general health and are paid regardless of whether or not services are actually provided and regardless of how many services are delivered. Last week, the Justice Department announced that eight counts of health care fraud had been filed against a Florida doctor. Dr. Isaac Kojo Anakwah Thompson allegedly operated a medical practice in Delray Beach that was part of Humana’s HMO network. Medicare beneficiaries who chose Humana’s MA plan could select Thompson and his clinic practice as their Primary Care Physician (“PCP”). The clinic received approximately 80% of the capitated fee that Medicare paid to Humana for each beneficiary who chose the practice as their PCP. According to the allegations, Thompson submitted fraudulent diagnoses to Humana for MA program beneficiaries. Since capitated payments received by MA plans are based on a patient’s medical conditions, these allegedly false diagnoses translated into a higher capitated payment from Medicare to Humana and, in turn, to Thompson’s practice. Overall, officials believe Medicare paid at least $2.1 million in excess capitation fees because of the fraudulent diagnosis. Of course, since the diagnoses were false, they didn’t result in any corresponding increase in what it cost Thompson to treat these patients. 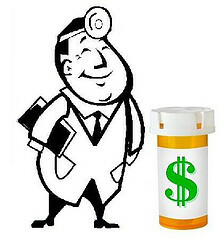 The capitated fee system relies on the trustworthiness of medical professionals. This should be a safe gamble, after all they’ve sworn to work only in their patients’ best interests. However, as medical care has become more of a business and less of an art, medical fraud has become increasingly common. While government agencies seem like an easy target, Medicare fraud diverts funds from people who truly need the money. We believe that there are more good people than bad and that almost every case of medical fraud comes across the desk of at least one person who objects. The question becomes – What does that person do? We hope that person speaks up and we are proud to provide the support to help them do just that. In addition to our California offices, we have relationships in Florida and across the nation that allow us to serve health care whistleblowers nationwide. Make a confidential call to learn more.